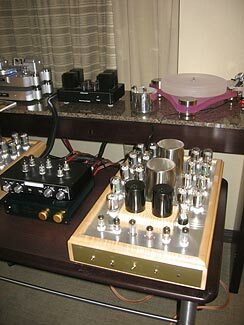 There is always an incident on my trips to the Salon Son & Image report of the Montreal high-end audiophile show. Those who have read my Salon Son & Image show reports over the past decade or so years know that I am a magnet for incidents. This year, as I approached Montreal on route 20 Est and thought I was going to be right on time to meet up with my Rochester audiophile buddy, Tom Lathrop. Until traffic stopped. A tall temporary gate blocked the entire road where a bridge was apparently missing. Of course all the signs warning of this obstruction were in French, so I was blindsided and forced to circle through town and backtrack to Route 40 which traversed the north side of Montreal. Fortunately, understood the word "detour" plus the fact that I was one of a long line of victims of this late night construction project was of little consolation. Fired up my mental global positioning system, refined over the course of 55K miles of hitchhiking back in the '60s and '70s, and honed in on the Hilton Bonaventure. After many miles on this industrial corridor, with only an occasional star to show me which end was up, I hung a right onto Route 13 south. A wide open flatland populated with blue lights was too large to be the Montreal Centre du Bocce & Curling. Sure enough, it was the airport. Soon, I was back on track and reconnoitered with Tom in the lobby just before midnight. As usual I chose not to nominate a first, second or third best room at the show. There are too many variables such as room size, the music playing at the time of my visit, and the ambient cackle of hosts and visitors. Rather, I�ve chosen the designation Best Rooms to identify those rooms that exemplify the greatness of our microcosm. They appear throughout this report and several appear near the very end of my story. If you were there, I hope you had as much fun as I did, and if you were not, I hope I�m able to stir up some enthusiasm for you. Aside from the somewhat confusing trail of rooms through the hotel, it was a great show. Next time I will bring my compass. And please don�t take my words here as gospel, but rather stir them in the pot with other show reports and see what might taste good for you. In the morning, after a delicious buffet breakfast in the hotel, I enlisted Tom to help me transfer some amplifiers I was returning to a manufacturer. I picked up my Press badge at registration and as you can see in the photo, blue is the national color of Quebec. 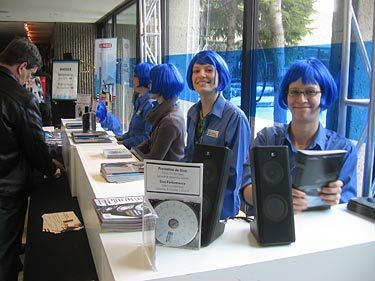 Not everyone in Quebec has blue hair; just an elite corps. These lovely ladies and other guides were helpful to visitors throughout the show. My first stop was the Son Ideal room where I spotted this new Rogue Athena tube preamplifier with separate power supply ($5K US). 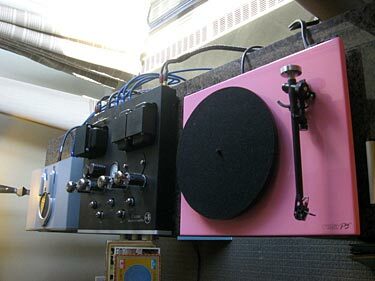 The power supply was connected with three separate balanced cables and the preamp featured both balanced and dual single ended outputs as well as a Tape Loop, Processor Loop and a Unity Gain input. What was actually playing in this room was a modest rig comprised of a Rega Apollo CD player, Rega P3 turntable and Rogue Cronus integrated tube amplifier ($2800) driving Harbeth HL Compact 7ES-3 speakers ($3600). It had a classic warm tubey sound that was inviting, if not accurate, and should be pleasurable for hours on end. The rig totaled about $10K. Shown here is a La Platine JC Verdier turntable with a Furutech Silver Arrows pure silver phono cable leading to a Rossner & Sohn Canofer phono stage. What were playing were an Ensemble CD player and integrated amplifier. The Ensemble speaker ($20K) featured a top of layers of aluminum with wood sandwiched between. The entire speaker was "floating" on its own suspension system. 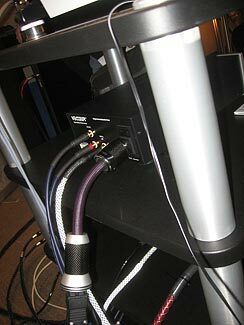 Because it is aluminum, the speaker had its own separate ground wire entwined with the speaker cable. The entire Ensemble line, I was told, was designed by one man, even down to the input connectors and power cords. 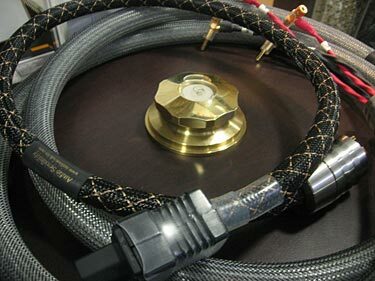 Shown here is the new Furutech Power Flux filter, a foot-long section of thick cable used on digital components inserted between the component and its power cord to nail the grunge at its source. In another room that was fronted by my friends from AuDIYo.com was a Furutech ST40 USB DAC with a headphone output with volume control and source selector. This cute little component was about 6" wide for desktop use. Inside I heard the Rossner & Sohn turntable again. The speakers here were the Klaro Summus ($3300 regular finish, $4K in piano black) that were much more impressive than the Klaro model I heard last year. Among other interesting features it had unique round aluminum vibration absorbing footers. In this rig they were driven by a Rowland Continuum 250, an ICE powered integrated amp which doubles down to 500 watts per channel into 4 ohms. 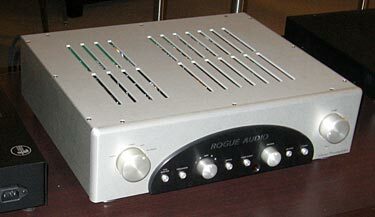 A CEC CD player was used as a transport for a Vector DAC. This was a very good sounding room, close to the best at the show. 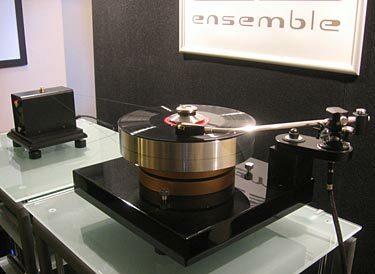 I was hoping to meet Larry Denham of TT Weights at the AuDIYO.com room again this year, but he was back at his "shop" putting together the first run of his Black Onyx turntable ($10K). 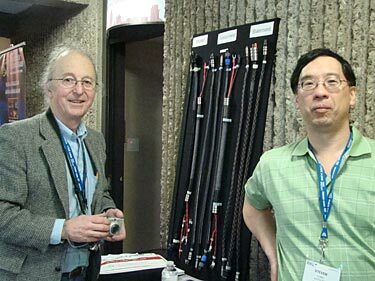 Shown here is their turntable weight in brass with a built-in level, surrounded by cable from Audio Sensibility who makes some reasonably priced power cables with interesting technology that I intend to pursue as soon as Steven Huang (seen below) catches up with the back-orders he amassed at the show. I�m shown here on the left with Steven. A pair of gorgeous McAlister OTL 195 monoblocks ($8500) was driving a pair of King Sound Prince II full range electrostatic speakers ($6500) to very good effect. The amps are stable down to 2 Ohms, which allows them to work with these speakers. I paid particular attention to outstanding transparency of these speakers to see how they compared to my open baffle Tekton Design reference speaker at home. The Kings sounded very good to me at a moderately loud level, but my friend Tom reported that at a very high level the previous day they were not as tolerable. The photo does not do justice to the beautiful tiger maple chassis of these monoblocks, although they could use additional fine sanding on the woodwork. The light natural finish of the amplifiers matched nicely with the wood frames of the King speakers.